I hope you are looking forward to our fall class! We will vote on 5 books (approx 1000 pages) to read together as a class. Feel free to make further suggestions, these are the ones that immediately come to mind. 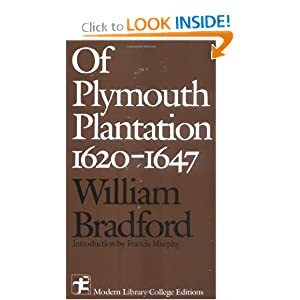 From 1630 to 1651, William Bradford wrote a history of Plymouth, the very colony he helped to establish and govern. Never published in his lifetime, the handwritten manuscript was lost during the Revolutionary War, and was rediscovered and published. No previous work on John Eliot's mission to the Indians has told such a comprehensive and engaging story. Richard Cogley takes a dual approach: he delves deeply into Eliot's theological writings and describes the historical development of Eliot's missionary work. By relating the two, he presents fresh perspectives that challenge widely accepted assessments of the Puritan mission. This book makes signal contributions to New England history, Native American history, and religious studies. the "praying towns"), and corrects misperceptions about the mission's role in English expansion. 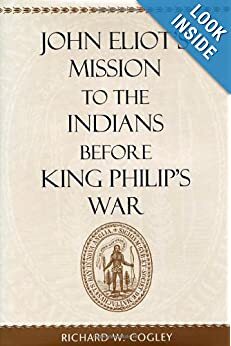 He also addresses other interpretive problems in Eliot's mission, such as why the Puritans postponed their evangelizing mission until 1646, why Indians accepted or rejected the mission, and whether the mission played a role in causing King Philip's War. Jonathan Edwards Professor of American Religious History, Yale University. Editor of OUP's Religion in America series, General Editor of the Works of Jonathan Edwards (Yale Press) and the Co-Director, with Jon Butler, of the Center for Religion and American Society at Yale. Through a richly detailed account of the genesis, flowering, and decline of the Puritan ideal of a church of the elect in England and America, Professor Morgan offers an important reinterpretation of a pivotal era in New England history. Historians have generally supposed that the main outlines of the Puritan church were determined in England and Holland and transplanted to the new world. 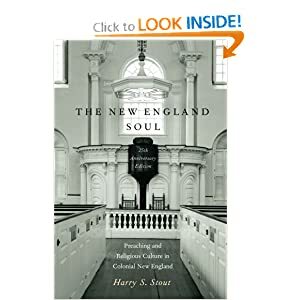 The author convincingly suggests, instead, that the distinguishing characteristic of the New England churches—the ideal of a church composed exclusively of true and tested saints—developed fully only in the 1630's and 1640's, some time after the first settlers arrived in New England. 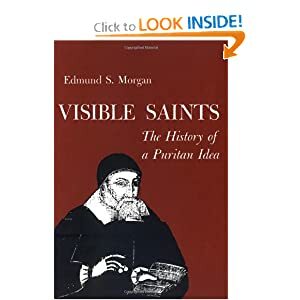 He also examines the influence of the Separatist colony at Plymouth on the later settlers of the Massachusetts Bay Colony, and follows the difficulties created by a definition of the religious community so selective that the New England churches nearly expired for lack of saints to fill them. Some Thoughts on the New England Revival aims to defend an unprecedented period of revival against the unjust words of its critics and the excesses of it friends, both of which, Edwards feared, would quench the Spirit and put a stop to the glorious work. What is a revival? How is it to be recognized? Is it a genuine work of the Spirit of God? If it is, how should it be acknowledged and promoted? These questions are taken up and answered by 'the theologian of revival', who, in God's providence, has supplied future generations of Christians with a sure guide on this vital subject. This is a great collection of primary documents. One of leading figures of his day, Roger Sherman was a member of the five-man committee that drafted the Declaration of Independence and an influential delegate at the Constitutional Convention. As a Representative and Senator in the new republic, he had a hand in determining the proper scope of the national government's power as well as drafting the Bill of Rights. In Roger Sherman and the Creation of the American Republic, Mark David Hall explores Sherman's political theory and shows how it informed his many contributions to America's founding. A close examination of Sherman's religious beliefs provides insight into how those beliefs informed his political actions. Hall shows that Sherman, like many founders, was influenced by Calvinist political thought, a tradition that played a role in the founding generation's opposition to Great Britain, and led them to develop political institutions designed to prevent corruption, promote virtue, and protect rights. Contrary to oft-repeated assertions that the founders advocated a strictly secular policy, Hall argues persuasively that most founders believed Christianity should play an important role in the new American republic. When a party of French and Indians attacked Deerfield, Mass., in 1704, 49 people were killed, including Reverend Williams's wife and two of their children. 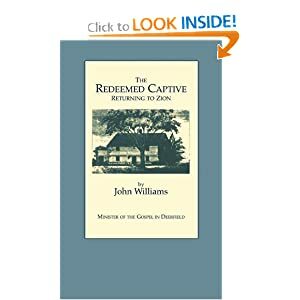 Williams's life was spared but he was taken captive. This is the story of the massacre and William's eventual release in his own words. The Great Awakening was the religious revival that swept through the American colonies between 1739 and 1742. A "great and general awakening" was the phrase used at the time by those impressed with the revival's spread from Georgia to New England and, as it seemed, through every element of the populace. 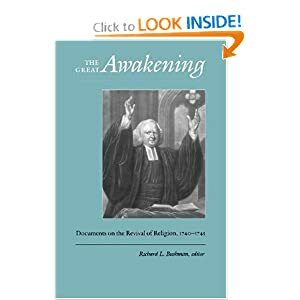 As the first in the almost uninterrupted series of revivals in America experienced in the following century, the Awakening of the 1740's was the revival by which churchmen and historians measured all others. 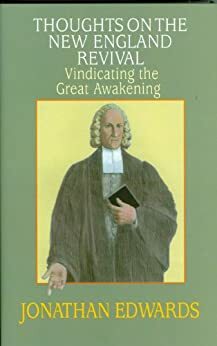 When in 1800-1801 another great revival, one that touched possibly even more people, occurred, it was called simply--much as the war of 1939-1945 was named--"The Second Great Awakening." This book is one of a series whose aim is to provide the essential primary sources of the American experience, especially of American thought. The series, when completed, will constitute a documentary library of American history, filling a need long felt among scholars, students, libraries, and general readers for authoritative collections of original materials. The series aspires to maintain the high standards demanded of contemporary editing, providing authentic texts, intelligently and unobtrusively edited. It will also have the distinction of presenting pieces of substantial length that give the full character and flavor of the original. The series will be the most comprehensive and authoritative of its kind. The Civil War was a major turning point in American religious thought, argues Mark A. Noll. Although Christian believers agreed with one another that the Bible was authoritative and that it should be interpreted through commonsense principles, there was rampant disagreement about what Scripture taught about slavery. Furthermore, most Americans continued to believe that God ruled over the affairs of people and nations, but they were radically divided in their interpretations of what God was doing in and through the war. In addition to examining what white and black Americans wrote about slavery and race, Noll surveys commentary from foreign observers. Protestants and Catholics in Europe and Canada saw clearly that no matter how much the voluntary reliance on scriptural authority had contributed to the construction of national civilization, if there were no higher religious authority than personal interpretation regarding an issue as contentious as slavery, the resulting public deadlock would amount to a full-blown theological crisis. 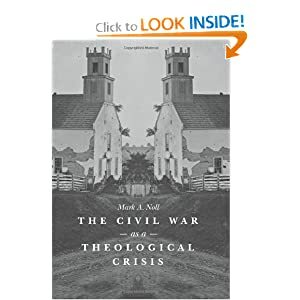 By highlighting this theological conflict, Noll adds to our understanding of not only the origins but also the intensity of the Civil War. 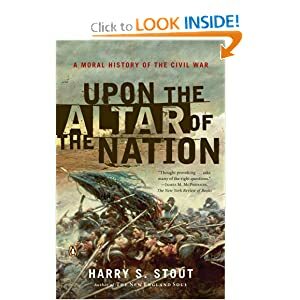 The Civil War was not only a war of armies but also a war of ideas, in which Union and Confederacy alike identified itself as a moral nation with God on its side. In this watershed book, Harry S. Stout measures the gap between those claims and the war’s actual conduct. Ranging from the home front to the trenches and drawing on a wealth of contemporary documents, Stout explores the lethal mix of propaganda and ideology that came to justify slaughter on and off the battlefield. At a time when our country is once again at war, Upon the Altar of the Nation is a deeply necessary book. 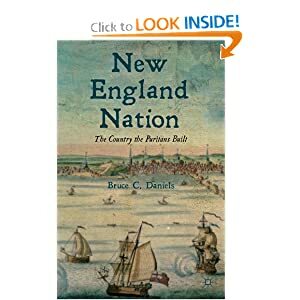 New England Nation provides an engaging social history of the extraordinary Puritan world that flowered into a vibrant civilization in seventeenth-century New England and then implanted itself into American history. The book opens by situating Puritanism in the European and English reformations and then examines seventeenth-century New England as an autonomous, holistic society based on Puritan principles, and also as a part of the Atlantic and British colonial worlds. It then teases out subsequent Puritan influence on the next four centuries of American culture. Farmers, sailors, and sinners join the usual Puritan ministers of the seventeenth century and so, too, do women, children, Indians, and dissenters. The physical and material world are included in the story as much as the spiritual world. Combining fascinating primary sources with a lively narrative, this book makes the first Pilgrim nation a believable place with real people who have many of the same fears and pleasures as today's Americans. The years from 1690 to 1765 in America have usually been considered a waiting period before the Revolution. Mr. Bushman, in his penetrating study of colonial Connecticut, takes another view. He shows how, during these years, economic ambition and religious ferment profoundly altered the structure of Puritan society, enlarging the bounds of liberty and inspiring resistance to established authority. This is an investigation of the strains that accompanied the growth of liberty in an authoritarian society. Mr. Bushman traces the deterioration of Puritan social institutions and the consequences for human character. He does this by focusing on day-to-day life in Connecticut--on the farms, in the churches, and in the town meetings. Controversies within the towns over property, money, and church discipline shook the "land of steady habits," and the mounting frustration of common needs compelled those in authority, in contradiction to Puritan assumptions, to become more responsive to popular demands. In the Puritan setting these tensions were inevitably given a moral significance. 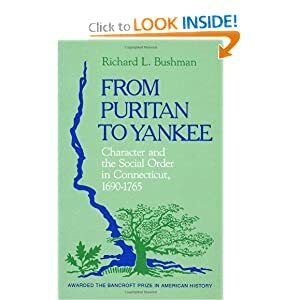 Integrating social and economic interpretations, Mr. Bushman explains the Great Awakening of the 1740's as an outgrowth of the stresses placed on the Puritan character. Men, plagued with guilt for pursuing their economic ambitions and resisting their rulers, became highly susceptible to revival preaching. 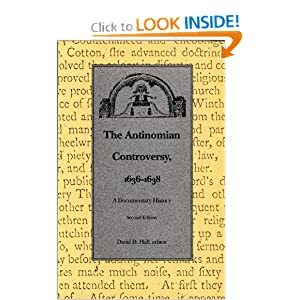 The Antinomian controversy—a seventeenth-century theological crisis concerning salvation—was the first great intellectual crisis in the settlement of New England. Transcending the theological questions from which it arose, this symbolic controversy became a conflict between power and freedom of conscience. David D. Hall’s thorough documentary history of this episode sheds important light on religion, society, and gender in early American history. This new edition of the 1968 volume, published now for the first time in paperback, includes an expanding bibliography and a new preface, treating in more detail the prime figures of Anne Hutchinson and her chief clerical supporter, John Cotton. 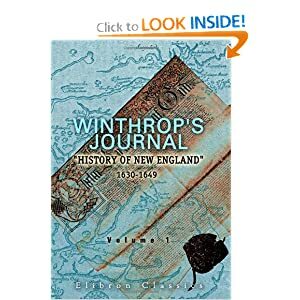 Among the documents gathered here are transcripts of Anne Hutchinson’s trial, several of Cotton’s writings defending the Antinomian position, and John Winthrop’s account of the controversy. Hall’s increased focus on Hutchinson reveals the harshness and excesses with which the New England ministry tried to discredit her and reaffirms her place of prime importance in the history of American women. This book, awarded the Brewer Prize by the American Society of Church History, is a study of the efforts of the Transcendentalists of the New England Renaissance to reform the Unitarian Church. Scholarly interpreters have, in general, agreed on the basic religious orientation of the Transcendentalist Movement. Mr. Hutchison, however, believes that it was far more than a tendency to appraise the universe in terms of an intuitive faith. Most of the men closely associated with the Movement in New England were Unitarian ministers, and he has concentrated on their attempt to apply transcendental thinking to theology and to the everyday problems of the parish ministry. 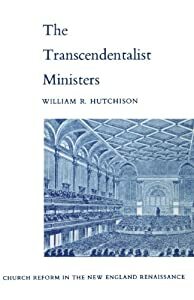 At the same time he has produced a sympathetic appraisal of the conservative Unitarian position in his review of the so-called Transcendentalist Controversy. Yale Historical Publications, Miscellany 71. Mr. Hutchison is associate professor of American civilization at The American University in Washington, D.C. This insightful book explores the structure and identity of American Protestantism in the twentieth century. The standard picture of these years portrays Protestantism as divided into two diametrically opposed camps -- fundamentalist/evangelical Protestantism and liberal/mainline Protestantism. The contributors to this volume -- Martin E. Marty, Richard Hughes, and twenty-one others -- challenge this two-party thesis, questioning such a division both on the basis of empirical validity and on the basis of contemporary usefulness. 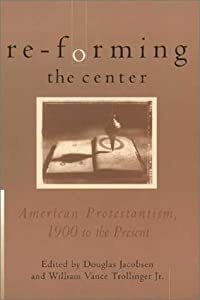 They show that the two-party model not only provides an inadequate map of American Protestantism during the past century but also distorts Protestant hopes for the future. When flicking through travel magazines on the North American east coast, one is likely to come across Massachusetts. Massachusetts is one of six New England states, and with respect to its history and its tourist attractions, this state is probably the most versatile and most interesting of them. Boston is the state’s capital and the largest city in the region. In addition, it is the only city north of New York that can assert itself next to that famed metropolis without competing with it. Rather Boston takes pride in a field that no other North American city can challenge: history and tradition. This book tries to explore questions such as: How did the association between nationalities and districts in Boston happen? Why is Boston often associated with the nickname “Irish Boston”? What were the reasons that led to the associations between the Irish and South Boston, and the Italians and the North End? What marks did the immigrants from Ireland and Italy leave on Boston? 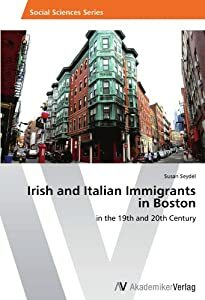 It will furthermore examine the political, economic, and social influence of Irish and Italian immigration on Boston.